Now for the fun! I just couldn't keep these new designs a secret any longer - they were just so cute I had to share them once I had a few photos. If you haven't seen them via Facebook, here they are. Peanut, a chipmunk with a cable pullover. He's sweet on his own, but in the pullover he looks like the star of a 70's knitting pattern book. His stripes are done with duplicate stitch, so you can follow what I've done or improvise your own stripe pattern based on the chipmunks in your neighbourhood. Kelby, a smooshy faced pug in a seamless hooded anorak. He's about the same size as the big teddy and bunny, so super cuddly for a little kid. His face is more complicated than most of my patterns, but it was necessary to get him to look just right. Don't forget to check out his tail. Mr. Mitten will get working on the individual patterns as soon as he has time (work is a bit crazy right now), so you can look forward to them soon! These two patterns will be replacing the Squirrel and Big Teddy in the new edition of Fuzzy Knits, so you can also look forward to them there. Posted by Barbara Prime at 1:05 p.m.
Love love love these two - totally gorgeous! Look forward to the patterns!! August 21, 2009 at 5:17 p.m.
OOOOhhhhhh! Beautiful! Hopefully they will also be available and sold as individual patterns too. I have every other one you have ever made. August 21, 2009 at 7:29 p.m. I love them. Great job with them. They are to cute for words. I am looking forward to adding these to my collection. August 21, 2009 at 7:38 p.m. I love the new patterns! I can't wait to purchase them! August 21, 2009 at 8:15 p.m. I LOVE your work. 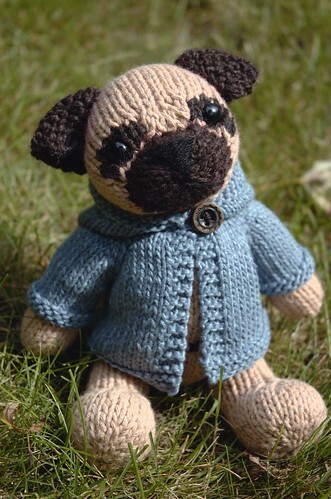 I am going to learn how to knit one day so I can create some of these darling toys! August 21, 2009 at 8:54 p.m. I just bought Festive Knits and made Batty for my grandaughter's birthday. I love the details on the pattern and it just came out beautifully. The grandkids have all gone through the patterns and I have orders for their favorites. I'm looking forward to making both of these new ones, too. August 22, 2009 at 7:29 a.m. Beyond precious! Looking forward to the patterns, I tell ya, my heart skipped a beat! August 22, 2009 at 8:42 a.m.
Too cute for words!!! I swear your patterns are taking over my limited knitting time, they are so fun to make and they are quick to knit up. August 23, 2009 at 12:23 a.m.
Wonderful-I am so looking forward to knitting these two lovely little chaps. August 24, 2009 at 6:29 a.m. I just love them... cant wait for the patterns....looking forward to adding to my collection of your patterns. Have a gread day. August 24, 2009 at 9:09 a.m.
August 25, 2009 at 8:46 a.m.
You've been busy! The new patterns are so sweet. 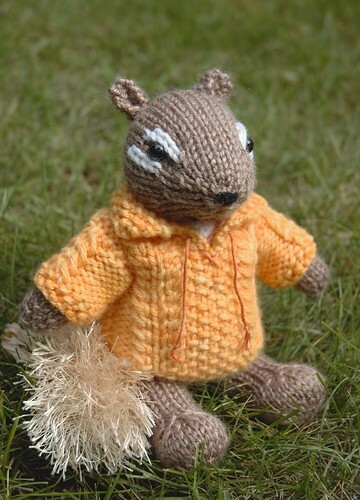 If I make the chipmunk I'll also have to knit up some acorns for him to hide. Good work, Ms. Mitten! August 25, 2009 at 11:54 a.m.
Marvellous .... love the chipmunk. Please do these patterns individually as I have all your other one's. August 26, 2009 at 7:28 a.m.
Fabulous! I love them both!! September 10, 2009 at 11:54 a.m. I can't decide which is cuter! You are so talented! September 10, 2009 at 8:16 p.m.